The hen harrier is one of the iconic species of the bird world and its history is a mix of controversy, persecution, and recent patchy recovery. This book, a dedicated study of the bird in N. Ireland for over two decades, provides a detailed account of the life, habits and prospects for the bird. 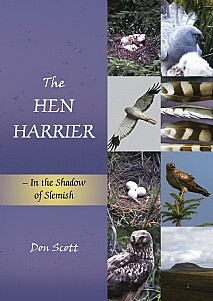 The author presents much new information about the harrier in its continuing struggle to re-establish its hold despite high levels of persecution from man or predation by other species. Having spent thousands of hours over many years studying these birds, he was rewarded by the discovery that this ground-nesting species was nesting in tall conifers in the forests of County Antrim – the only country throughout their vast European range where this occurs annually. Other significant finds soon became apparent as did the discovery that red kites were nesting for the first time and marsh harriers had returned to nest for the first time in almost 200 years. The author’s passion for the bird is obvious as he shares moments of excitement and sadness, and he speaks frankly about the maltreatment and mismanagement of this elegant raptor over the years. This is a book for the bird enthusiast, the environmentalist and indeed anyone with an interest in our wildlife and landscape – an unmatched account not to be missed.